Happy Halloween! 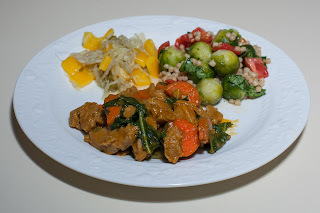 I had a little pumpkin puree on hand and was very happy with my recent (October 18th) experiment cooking with seitan and pumpkin puree. I came up with the idea of cooking seitan with vegetables and pumpkin, then mixing in fresh, raw tomatoes when I served. I made the mistake of mixing the tomatoes in with the couscous which I had thought to make as a side dish - and, in hindsight, I think my "mistake" was fortuitous as it nicely elevated the taste and presentation of the couscous. Here's what I did. 3/4 cup onion cut into thin half moons app. 1/4" x 1 1/2"
Whole wheat couscous cooks in a 1 : 1.5 ratio to water, but I accidentally used 1:2. I put the couscous, water, salt, and bouillon cube in a small pan and brought to a boil. I added the Brussels sprouts, let the temperature come back to a boil, then simmered on low heat, covered, for 10m. In parallel, I made the main course by cooking waterlessly. I put, in this order, the onion, seitan, carrot, kale, and pumpkin into a large Saladmaster stock pan. I covered the pan and heated it on medium high until the vapor release started jiggling, then I reduced the heat to low till the jiggle stopped. I let it cook for about 20 minutes. When I was ready to serve, I mixed in salt in equal parts (i.e., 1/4 t each) to each dish; to the couscous dish, I also added the tomato and basil. Dinner was good. I liked the main course, though I think that I preferred how I prepared the seitan and pumpkin better almost two weeks ago. The couscous was very good! I should in fact try a simple seitan and pumpkin dish with fresh herbs and raw tomato added when served. I'll bet such a dish would be good. I'm glad that recently I've been making whole wheat couscous dishes, and need to keep experimenting. Fresh dill or oregano would be a nice addition, and cubed squash would be great with the couscous. I was trying to decide what to make for dinner tonight when my daughter suggested using a Trader Joe's brand cauliflower pizza crust. We rarely go to Trader Joe's, but did visit last week and I found and bought this crust. I thought that it would be like a soft cauliflower "shell" but it turned out to be a thin disc. In Food for Life classes, I love teaching a citrus fennel salad and today came up with the idea of making a chickpea salad with citrus. I combined chickpeas with tangerine pieces, salt, miso, fresh basil, roasted bell pepper, and freshly ground black pepper. 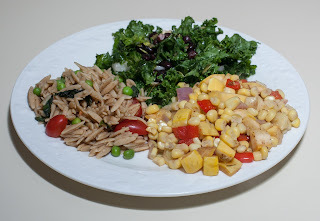 I also served leftover Mexican kale salad from my Food for Life class this past Sunday. The crust was a bit crumbly and broke into a few pieces when I turned it over in the oven. 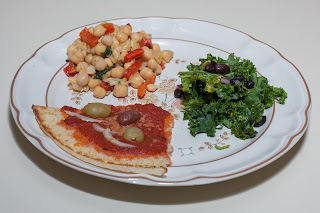 Though my family enjoyed it (and I did to some extent), I thought that the crust was not nearly as good as regular wheat crusts or even other gluten-free crusts I've had. The chickpea salad was good; I should build on the idea and include additional ingredients like citrus zest and cumin. I wanted to continue experimenting with pumpkin puree to add a holiday taste to main courses, like I did with my seitan dish last Wednesday. I thought that I'd try a dhal. 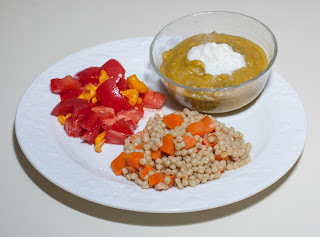 I put the lentils, pumpkin, eggplant, garlic, turmeric, and water into my Instant Pot pressure cooker and cooked for 16m. After the cooking was done, I waited a few minutes and gently released pressure, then mixed in the tangerine juice and salt. I served with my homemade soy yogurt. My family enjoyed the meal. I did, too, but wish I had added onion to the couscous for more flavor. The dhal was fine and nice and thick, but I think could have also had more flavor. Pumpkin didn't really enhance dhal, though I can try other approaches, such as a pumpkin soup with a little lentil dhal mixed in. My friend Fran Costigan is in town for a cooking demonstration tomorrow and I was lucky to meet her today for lunch. I wish that I could attend her demonstration tomorrow but hope that we can have her back for an event in the future. For dinner tonight, I decided to make a waterless dish. Here is what I did. I put, in this order, the leek, sweet potato, edamame, and kale into a large Saladmaster stock pan. I cooked waterlessly - i.e., I covered the pan and heated it on medium high until the vapor release started jiggling, then I reduced the heat to low till the jiggle stopped. I let it cook for about 20 minutes. When I was ready to serve, I mixed in the lime juice, turmeric, and salt. I also made a guacamole and tomato salad with oregano, salt, pepper, Ume plum vinegar, and lime juice. I was thinking of, with respect to the upcoming Halloween season, making a pumpkin dish. I didn't have much time to put dinner together and had hoped to find cubed pumpkin, but I didn't. Instead, I bought organic pumpkin puree. Here is what I did. I put, in this order, the garlic, seitan, tomato, bell pepper, and pumpkin into a large Saladmaster stock pan. I cooked waterlessly - i.e., I covered the pan and heated it on medium high until the vapor release started jiggling, then I reduced the heat to low till the jiggle stopped. I let it cook for about 15 minutes. I then mixed in the spices and served, along with brown Basmati rice and a tomato-olive salad with Ume plum vinegar, lime juice, salt, and pepper. Dinner was great! We all loved it. In hindsight, the puree worked out better than the cubes. I used the right amount to include the pumpkin flavor without overwhelming the dish. It formed a very nice curry sauce. As usual, the meal was one with no added fat, but it tasted sumptuous. I should explore more dishes with pumpkin puree and not wait for the Halloween season. I bet that a little bit of pumpkin puree could be beneficial in many dishes. Pumpkin puree and potato chunks? Kohlrabi even? I bet there's a lot of great dishes waiting to be explored with pumpkin puree. My daughter and I were out and came home with my wife and daughter hungry, so I got to work cooking right away. We picked up thin sweet potatoes from the farmers' market this weekend, which I was anxious to cook. I also got from the market a cross between kale and Brussels sprouts called kale sprouts; I described in March 2015 finding these in the market place as kalettes™ and really enjoyed them (today my family popped the raw ones in our mouths and loved them, stems and all). I've not found them more recently until I saw them this weekend. I thought that I'd use kale sprouts for the main course. I wanted some sort of bean or maybe seitan to go with it and didn't have any beans soaking. Luckily, for times like this, I have a few cans of chickpeas on hand. In order to bulk up the meal, I thought I'd use a tube of prepared polenta that I had on hand. My wife recently returned from a trip to Bulgaria and found ample vegan options and great food choices. 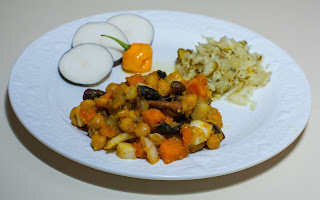 She brought back a spice called "savory", which appears to be something like savory (chubritsa), a common table spice. I thought that I'd try seasoning with it. Here is what I did. I cooked the main course waterlessly by putting, in this order, the onion, polenta, and kale sprouts into a large Saladmaster stock pan. I cooked by covering the pan and heating on medium high until the vapor release started jiggling, then I reduced the heat to low till the jiggle stopped. I let it cook for about 15 minutes. I then opened the pan and mixed in the tomatoes, chickpeas, and spices. Sweet potatoes cook in 10-19 minutes of pressure steaming, but I went with 9 minutes, serving five of these small sweet potatoes for each of my wife, daughter, and me. They were great! In fact, they could have been done in 8 minutes. But I liked the organic way in which the sweet potatoes were gently burst open. And the sweet potatoes were light, much less dense than Japanese sweet potatoes (my favorite variety). Since they were organic, as we usually buy, I ate them intact, skin and all. I also served green luobo radish, from the farmers' market as well. Dinner was good! My one regret was with the kale sprouts; they were great, without any trimmed away, raw. They were also good cooked, but in the dish were just too big and should have been chopped. I liked the Bulgarian spice, which added a nice flavor that I can't really characterize except maybe as a non-hot Mexican sage and pepper seasoning. The sweet potatoes were very good! I wonder why I don't cook with polenta more often. I should more frequently keep pre-made tube polenta on hand - but I should also make polenta from scratch. I think that I've only done that once, in June 2014, and it was both easy and very good. I should try a dish like this one, perhaps with chopped greens, polenta, and maybe a lot of mushrooms. A more complex tomato sauce would be good, maybe with green tomatoes cooked into it (hey, that's another idea - combining cooked green tomatoes with tomato sauce). I wanted to make a chickpea dish so soaked some chickpeas. 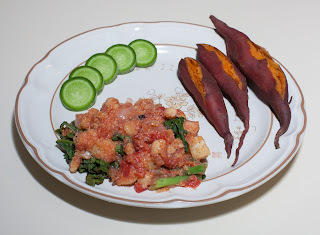 I loved the waterless sweet potato I had recently made and hoped I'd cook sweet potato this way again soon. Here is what I did. I put the chickpeas, water, bouillon cube, and garlic into my Instant Pot pressure cooker and cooked for 20m (unsoaked take 35-40 and soaked take 10-15 minutes, but I wanted them nice and soft). While it was cooking, I did a waterless cook of the sweet potatoes. I put, in this order, the green onion, sweet potato, and mushroom into a small Saladmaster stock pan. I cooked waterlessly - i.e., I covered the pan and heated it on medium high until the vapor release started jiggling, then I reduced the heat to low till the jiggle stopped. I let it cook for about 20 minutes. When I was ready to serve, I carefully let out remaining pressure from the chickpeas, mixed in the sweet potatoes, as well as the onion, lemon juice, turmeric, cumin, and salt. I also served Farmhouse Culture brand "garlic dill pickle" fermented vegetables (cabbage, water, salt, cucumber, dill, garlic), as well as Black Spanish Radish (it was spicy). Dinner was good! I was given the local sweet potato by somebody at the venue where I teach on Sundays who said that she had grown it and just picked it - it was surprisingly tender and easy to cut. The sweet potato and chickpea combination was surprisingly consonant and tasty, and I loved the texture. Waterless sweet potato is so good! I should continue to explore good combinations with chickpeas. I prepared red pinto beans in the pressure cooker (soaked and then rinsed and cooked for 23 minutes with just enough water to cover the beans). Once done, I mixed in most of a 14.5 can of roasted diced tomatoes, a clove of elephant garlic diced to between 1/8-1/4" cubes, a little ginger similarly diced, a bit of salt, freshly ground black pepper, and dried oregano, and simmered on low for about 7-10 minutes. Dinner was very good! My wife particularly loved it. I included green radish; it was good though a bit strong. This dish reminded me a bit of Indian rajma. 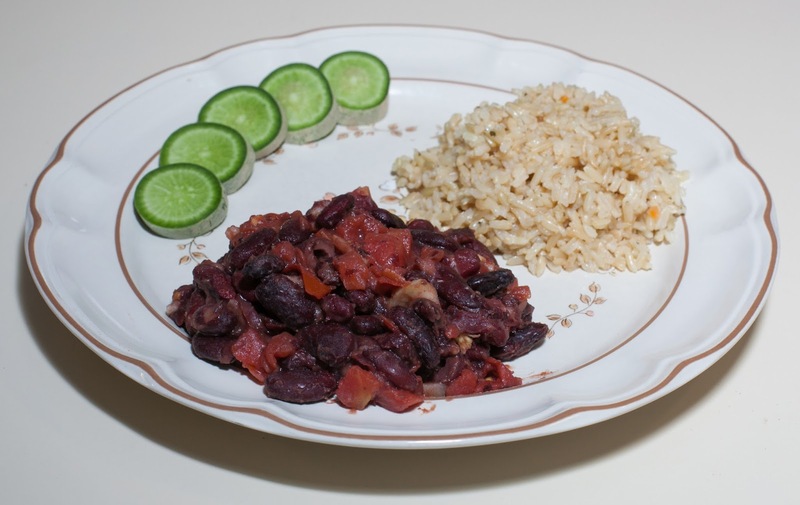 I should make rajma and should experiment with more red bean dishes. I'm not sure why I don't use red beans more often. A few days ago when shopping, my daughter suggested picking up some whole wheat pearled couscous. I had a portabello mushroom left over from yesterday's Food for Life class (Kickstart Your Health class 2, where I served oatmeal with apple, a chickpea - quinoa salad, and portabello fajitas). Here is the meal that I put together tonight. I put the garlic and onion into a small Saladmaster stock pan and cooked on medium, stirring, for 3-4 minutes till nicely fragrant. I added the artichoke and carrot, and continued to cook, stirring occasionally, for another 3-4 minutes. I added the couscous, water, bouillon cube, and salt, and cooked, covered, for about 10 minutes. While the couscous was cooking, I put the leek on a cast iron pan and started cooking over medium heat for about 3-4 minutes, stirring occasionally. I then added the mushroom to the cast iron pan and continued cooking for another 2 minutes. I added the seitan to the cast iron pan and continued to cook, stirring, for another 3-4 minutes. 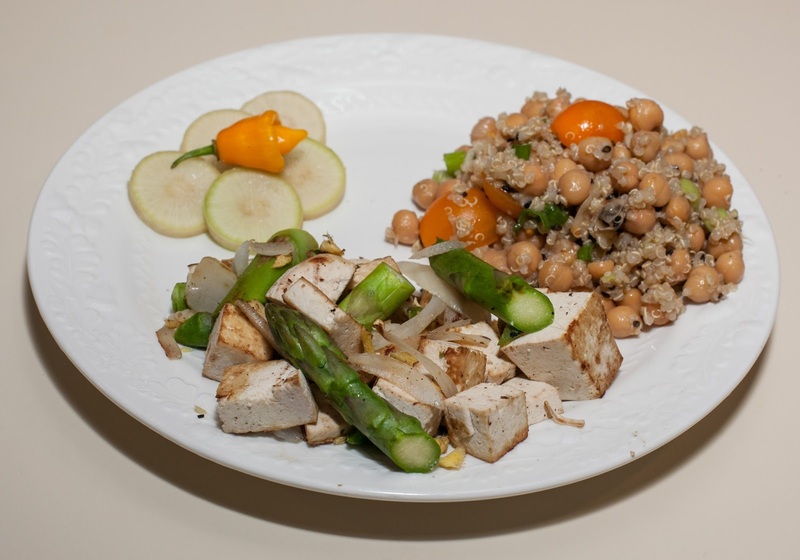 When both dishes were done, I mixed in the garlic powder, nutritional yeast, and fennel seeds to the couscous. I served the seitan dish, sprinkling a few drops of lemon juice, a little salt, and, for my wife and me, jerk seasoning on top. 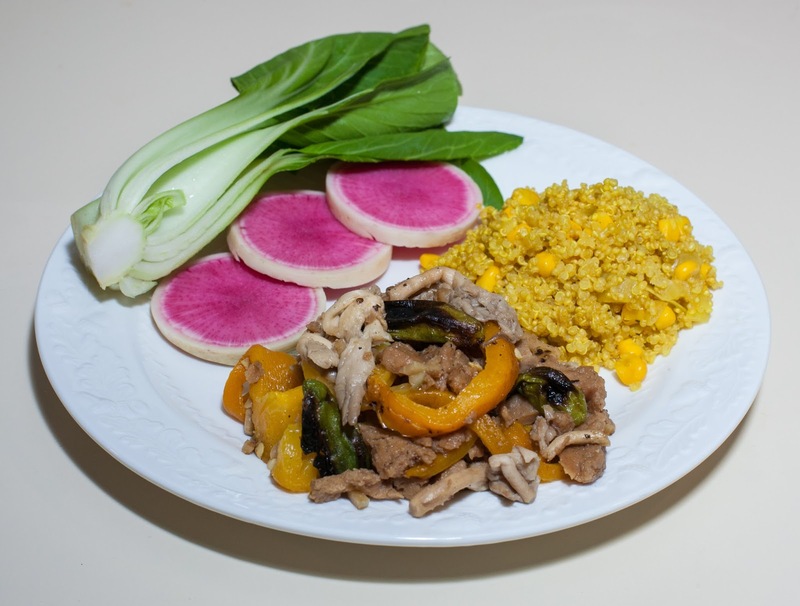 I served the couscous as well, plus some thick slices of heirloom tomatoes. Dinner was very good, though the couscous was underspiced for my wife's taste. My daughter and I quite enjoyed it; I thought that the fennel, almost an afterthought, worked great. We all loved the seitan dish! 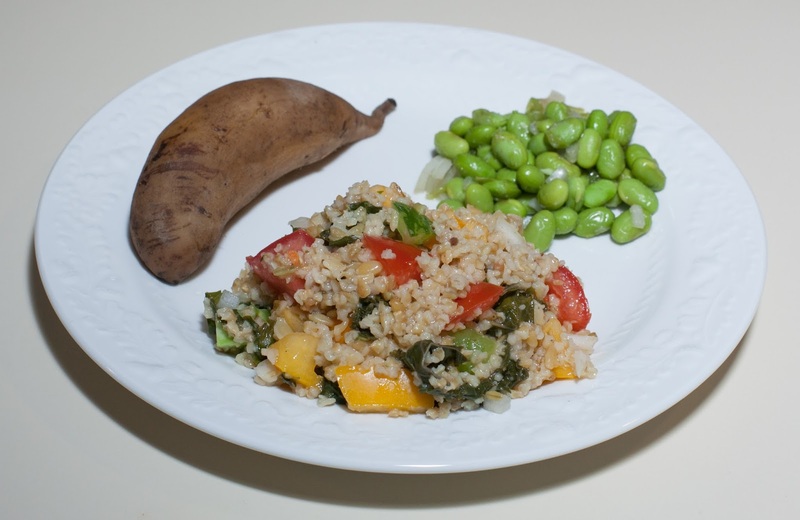 I should cook with whole wheat pearled couscous much more frequently; I think I have used it just a handful of times. I could make a soup with a rich broth or maybe cook an Italian-inspired dish with marinara sauce and couscous. I wonder what it would be like to mix the couscous with thin brown rice noodles and maybe shiitake mushrooms, ginger, garlic, and coconut aminos. I should also cook with portabellos more often. I wonder what a 0-minute pressure cooked portabello would be like? I found fermented vegetables from Farmhouse Culture brand on sale at the store today, and purchased "garlic dill pickle" fermented vegetables (cabbage, water, salt, cucumber, dill, garlic). The corn yesterday was such a hit that I made something similar today using an Anaheim pepper and sale priced leek. Here is what I did. I put, in this order, the leek, fennel, edamame, and kale into a small Saladmaster stock pan. I cooked waterlessly - i.e., I covered the pan and heated it on medium high until the vapor release started jiggling, then I reduced the heat to low till the jiggle stopped. I let it cook for about 20 minutes. I added the sauce, mixed, and covered the pan again, letting it cook for another 5-7 minutes or so. I mixed in the salt and served. 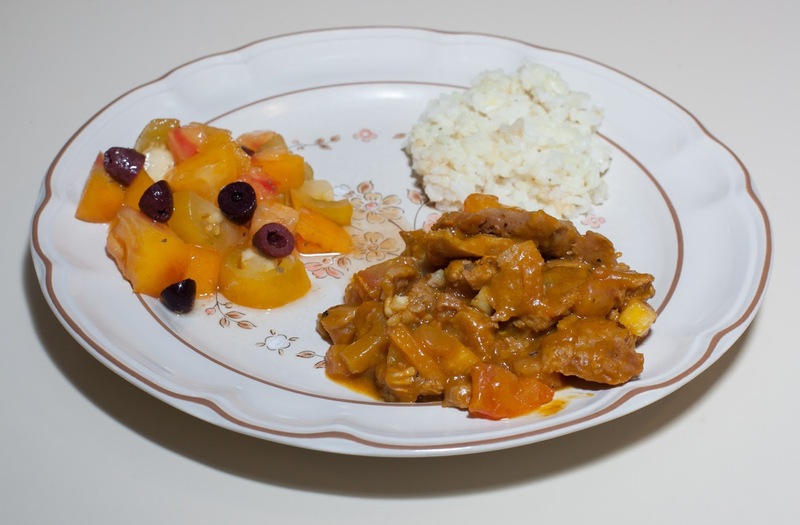 I also served the fermented vegetables with some small, tasty, cherry tomatoes, as well as corn. I heated frozen corn like I did yesterday by putting it in a bowl atop a steamer rack with about 1/4 cup of water in the Instant Pot pot, and then pressure steaming for 1 minute (I used a deep bowl with a lot of corn, and some was still cool, so I cooked for another "0 minutes" - i.e., I brought up to pressure then turned off). I sauteed on a cast iron pan most of an Anaheim pepper cut into maybe 1/4" x 1/2" strips, along with maybe 1T of leek, cut into approximately 1/4" squares. Along with a bit of Meyer lemon juice and salt, I mixed the pepper and leek into the corn and served. 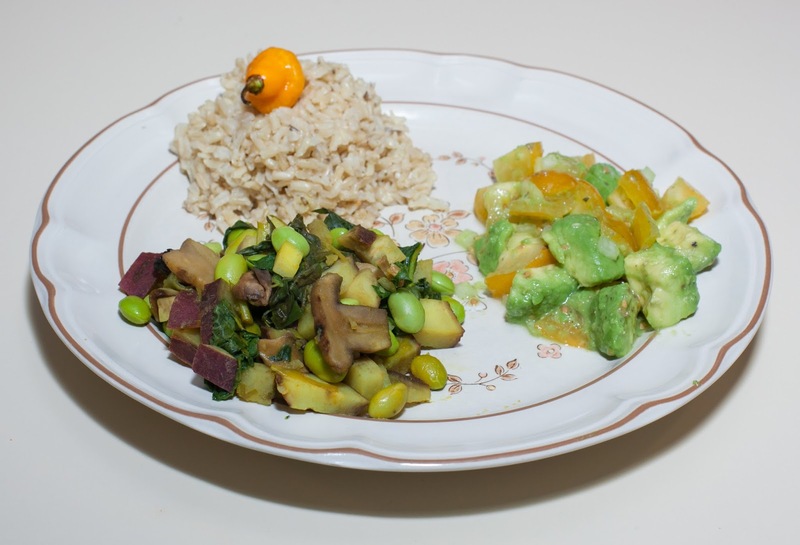 The main course was good; I wish that I had had more edamame on hand to make more of the dish. The fermented vegetables were quite sour and would be better served mixed with something like perhaps a grain or atop a burger. The corn was good but I liked the stronger pepper that was also more charred from yesterday. I should come up with some more ways to serve the fermented vegetables, such as with a grain, maybe with potatoes, and/or with a burger or something like seitan. 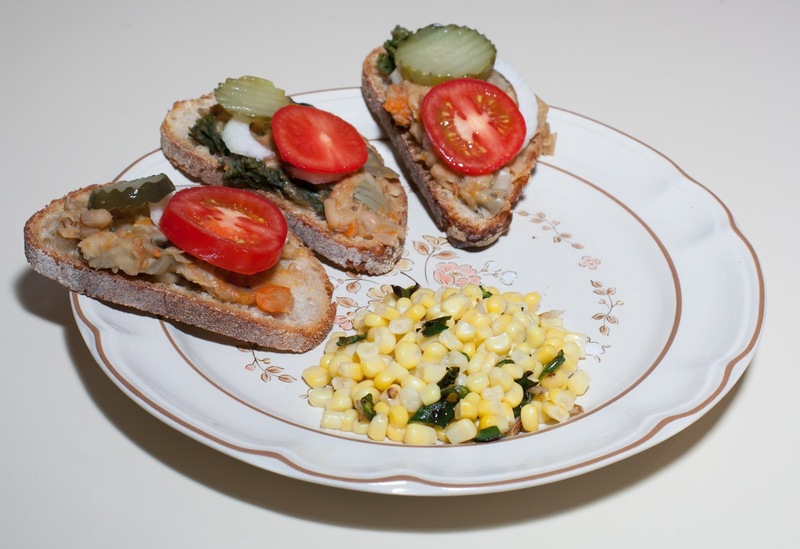 I loved the white bean and artichoke dish from Saturday and thought of serving it as a spread on some nice fresh bread that I had purchased today. I simply reheated the bean dish and served it atop bread, topped with pickle and slice of onion. I purchased a kind of pepper that I've not had before, maybe 6" long and maybe 1 1/2" wide, said to be a bit hotter than a jalapeno. I was thinking of blending the pepper with the bean for the spread, but it turned out that the pepper was quite mild. Instead, I prepared some white corn and mixed in the pepper, after cutting the pepper into approximately 3/8" squares and cooking on a cast iron pan with no oil and over medium heat, stirring occasionally, for about 5 minutes.